3A Composites USA is pleased to announce that it has expanded its color selection of ALUCOBOND® Axcent™ flat stock — a line of painted 0.040″ aluminum sheet designed for installation as building trim — to include all stocked colors in the company’s ALUCOBOND® Plus aluminum composite material (ACM) Classic line. ALUCOBOND® Axcent™ is a 0.040″ flat aluminum sheet that is perfect for any building project that requires painted metal trim, including building fascia, flashing and roof caps. Axcent™ expands design possibilities by offering the perfect finishing touch to projects clad in matching ALUCOBOND® Plus ACM colors. 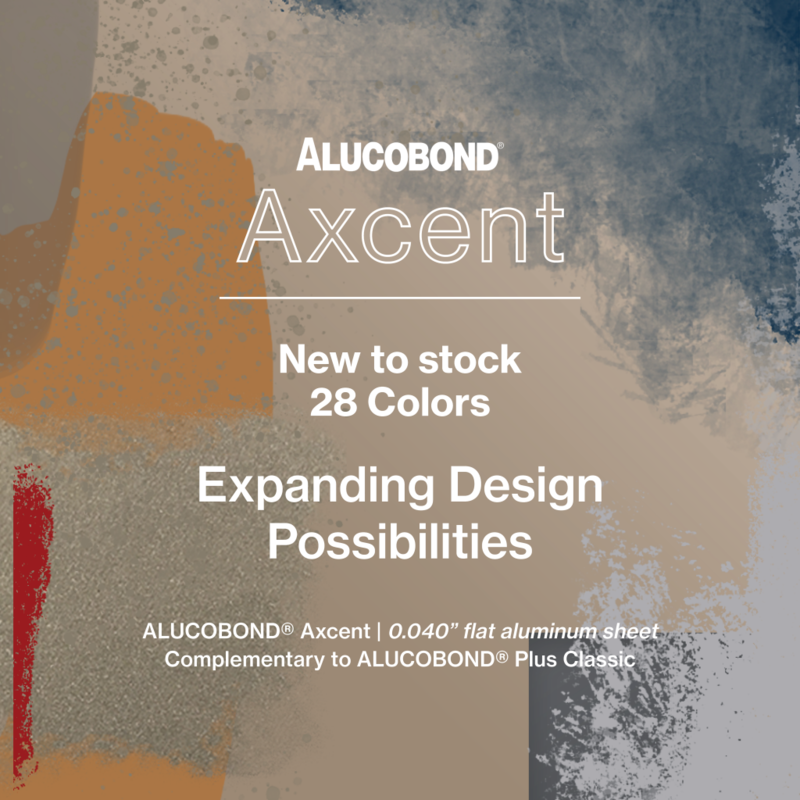 ALUCOBOND® Axcent™ now will include colors complementary to the ALUCOBOND® Plus Classic line, which consists of a wide range of colors currently in inventory. These colors provide architects and designers with a color palette capable of meeting the needs and time frames of most projects. Originally introduced in 12 colors, ALUCOBOND® Axcent™ now will be available in a total of 28 stocked colors complementary to the ALUCOBOND® Plus Classic line, including: Alabaster, Anodic Clear Mica, Anodic Satin Mica, Azure Blue, Bone White, Brilliant Silver, Cadet Gray, Castle Gray, Champagne Metallic, Driftwood Mica, Dusty Charcoal, Focus Black, Harvest Gold Mica, Hazelnut Mica, HWH Bio White, JLR Champagne Metallic, JLR Gray Metallic, Oyster, Patriot Red, Platinum Mica, Poly White, Red Fire, Russet Mica, RVW White, Silver Metallic, Statuary Bronze, Sunrise Silver Metallic, and West Pewter Mica. ALUCOBOND® Plus consists of two sheets of 0.020″ aluminum thermobonded to a proprietary fire-resistant core and is manufactured in the standard 4mm thickness. ALUCOBOND® Plus provides extraordinary flatness and rigidity, excellent formability, low weight and outstanding weather resistance. ALUCOBOND® Plus wall panels have a flame-spread index of less than 25 and a smoke-developed index of less than 450 when tested in accordance with ASTM E 84, and have a Class A interior finish classification. Introduced in 1969, ALUCOBOND® is the original and world’s best-known aluminum composite material. ALUCOBOND® is manufactured in the United States in the Benton, Ky., plant of 3A Composites. The 3A Composites USA headquarters are based in Davidson, N.C. For more information about ALUCOBOND® Axcent or ALUCOBOND® ACM, call 1-800-626-3365, email info.usa@3AComposites.com or visit www.3ACompositesUSA.com. 3A Composites has developed, manufactured and marketed high-quality aluminum composite panels, structural composite material, plastic sheets and lightweight foam boards for architecture, visual communication and the transport and industry markets since 1969. 3A Composites is part of the international 3A Composites Group, which belongs to the listed company Schweiter Technologies headquartered in Horgen, Switzerland. 3A Composites has approximately 4,400 employees worldwide. 3A Composites’ well-known brands ALUCOBOND®, DIBOND®, FOREX®/SINTRA®, GATOR®, KAPA®, FOME-COR®,ALUCORE®,AIREX® and BALTEK® are the category leaders in the markets served. ® ALUCOBOND is a registered of 3A Composites USA. ™ Axcent is a trademark of 3A Composites USA. This entry was posted in Company News. Bookmark the permalink. Follow any comments here with the RSS feed for this post.